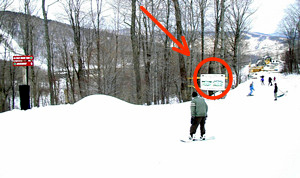 When Topridge Development at Killington needed large outdoor signage they contacted us. The signs needed to be 4' x 6', able to withstand brutal mountain weather, and display high-quality drawings of these luxurious homes. Using an adhesive backed vinyl the graphics were printed on our HP DesignJet. The signs were mounted onto a frame of 2" x 6"'s that a contractor had installed. Mounting brackets were constructed to allow the sign to be hung first and allow adjustment. The printed vinyl material was mounted to a 3/4" sheet of exterior grade plywood, with the edges wrapped around. Since Topridge Development is a trail-side community, it was only appropriate that the signs be trail-side also. REPRO performed the installation to assure successful completion of the project in a timely manner.